So, your app just got approved for the App Store. Congratulations! So after you send your link to your mom and your brother, you realize you’re going to have to figure out a more effective way to get your app in front of people. Your initial downloads are incredibly important. It helps you drive your app up the charts. Note: If you’re already sold on using PR to distribute your app, skip to the section entitled, “1. Make it Newsworthy”. Obviously, it’s best for you to consider growth as you build your app. That means keeping your marketing strategy in mind as you prioritize features and build your product. However, if you’re reading this now, it’s probably too late for that. The best time to figure out user acquisition was six months ago, when you came up with your company or app idea. The next best time is now. We’ve spent five years figuring out how to drive sustainable downloads for our apps. PR is just one piece of the puzzle. We’re still learning a lot every day. 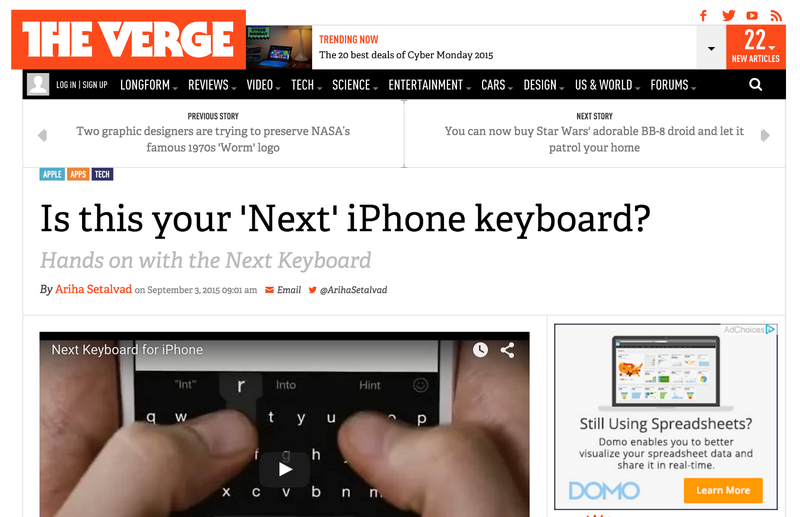 We recently hit #2 on the App Store with Next Keyboard and we’ll be sharing how we did it in our newsletter. Like what you’ve read so far? Join our infrequent newsletter to learn things like ‘How to get discovered on the App Store’ and ‘How to Make Products that People Love’. Why did we pick PR? For starters, PR isn’t restricted by capital constraints. It is easy on the budget. Even if you don’t have boatloads of cash, you can make up for it with hustle— time and energy. Press coverage tends to precede an increase in downloads. When we develop our press outreach plan, we tend to have two categories: general publications (e.g., sites like The Verge, Mashable, Lifehackeretc.) and targeted blogs — depending on what audience the product appeals to. We figure general publications will have large volumes of casual users, whereas targeted blogs will have smaller volumes of curious users. It makes for a healthy balance. PR is also pretty simple to execute on. If you’re creating products at a company that’s strapped for resources (and this happens to companies at all levels, big and small), and you hadn’t been allocated PR or marketing resources, you can roll up your sleeves and do it yourself. You can reach out to 100 news reporters and not hear back from anyone. Because your product and your story aren’t newsworthy enough. I hate to break it to you, but the media operates in a story-driven attention economy. You have to make things compelling for the reporters or writers that you’re pitching. For us, our product Next Keyboard wasn’t particularly controversial by default. We also didn’t plan on going down the gimmick-y, sensational, route. However, we did have some other ways of developing our story. For example, we’d raised funds on Kickstarter and were the most funded app for a short while. The general principle is for you to look into any milestone you’ve reached that would make someone go, “Cool.” Talk about it with your friends, and see what catches their attention. Prove that you already have traction or interest, and the story becomes more newsworthy. Share some of your processes, which might be unusual and newsworthy. For us, we developed our app with tight feedback loops and heavy involvement from our Kickstarter community and from communities on Reddit, Designer News, and Product Hunt. You’re not going to hit anywhere near 100% of your press outreach. For example, when we were doing outreach for our Kickstarter campaign, we found out the hard way that Lifehacker and The Verge didn’t write about Kickstarter campaigns. 2. Use Emails to Pitch and Email differently. I’ve got some exciting news to share with you. We’re launching Next Keyboard this Thursday after more than a year of hard work and a successful Kickstarter campaign (was the most funded app). Let me know if you’re still up for covering it :) The latest beta is in review right now but I’ll get it to you as soon as it’s approved. Look at it, it’s super simple. Reporters don’t have time to read your email, so don’t spend too much time crafting it. Spend time editing and cutting it down. Don’t waste your subject line or your first line in an email. Subject line: Make it close to the headline you envision for your article. About: What are you launching? CTA: Let me know if you’re up for covering it. 3. Go above and beyond email pitches. Emails shouldn’t be the only way to get attention. It’s not going to convert well. For starters, dig into who covered something similar to your product before. Know who might care about it. Know what these people stand for, and how are they incentivized. Have a look at what their most popular posts are. Know who you’re pitching and what they’re personally interested in. 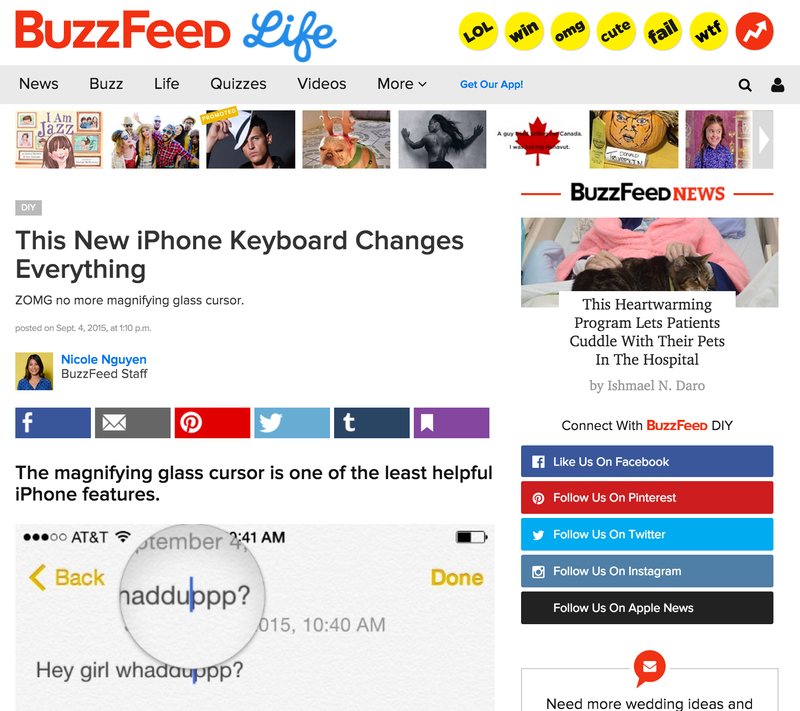 For example, when we were connecting with BuzzFeed, we knew that their writers were fluent in GIFs and memes. So we figured, let’s send her something in that format. And it worked! They ended up writing the super funny GIF-filled piece below. Even in an email, spice things up. Send things that go above and beyond your product. The writer, or reporter, is a human. Make them smile. Be genuine. When you’ve tailored your emails, make a list of your top five blogs. They can be a mix of general publications for casual users, and targeted blogs for curious users. The downside of email pitches is everyone is doing them. That’s why we experimented with other conversation starters — like physical products. 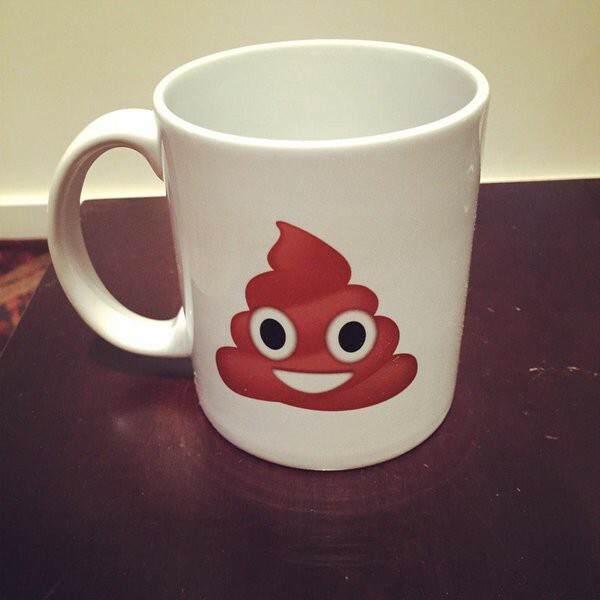 For example, we sent a poop emoji mug, which we’d made for our Kickstarter campaign, to a writer who covered technology for Mashable. Her colleague wrote about us a few days later. What a funny coincidence. Usually, media kits would be folders of fact sheets, text files, and images or PDFs in Dropbox. You can edit it! So if you think of a better headline or angle, or need to update any information, you can do that easily without sending a bunch of new emails. 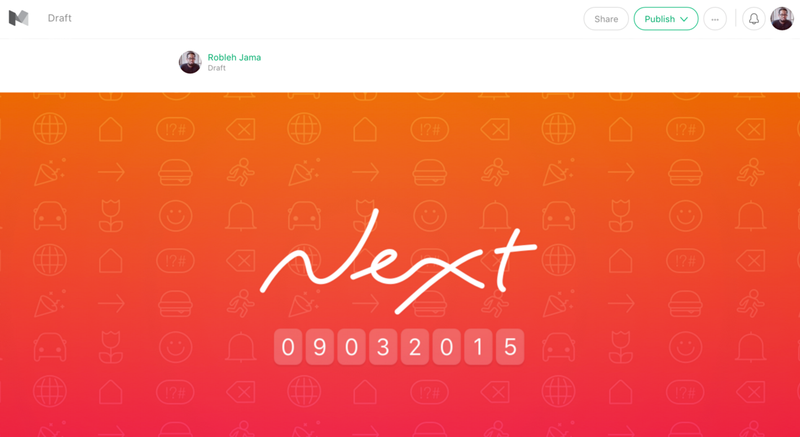 Medium.com is also well-designed and beautiful. It’s convenient because the writer doesn’t have to download anything. It’s also easy for them to copy and paste. Writers are used to reading on Medium.com, and your media kit looks like a blog post. Wonderful. You can embed video links into the kit. You can also link to Dropbox if you want to attach any high-res images or GIFs, or larger types of files. It’s just a URL and it makes blogger’s jobs a little easier. We suggest this idea to a lot of our clients. They love it. You might want to keep your media kit unlisted, and keep the content just for writers. Again, at the very least, Medium.com is a different way to present your news. It enables you to do things differently. Best of all, you share the news on a platform they’re already familiar with and they already use. When you put everything a writer needs for their article in one spot, they’re going to like that. They’re going to appreciate you. And that increases your chances of getting attention. 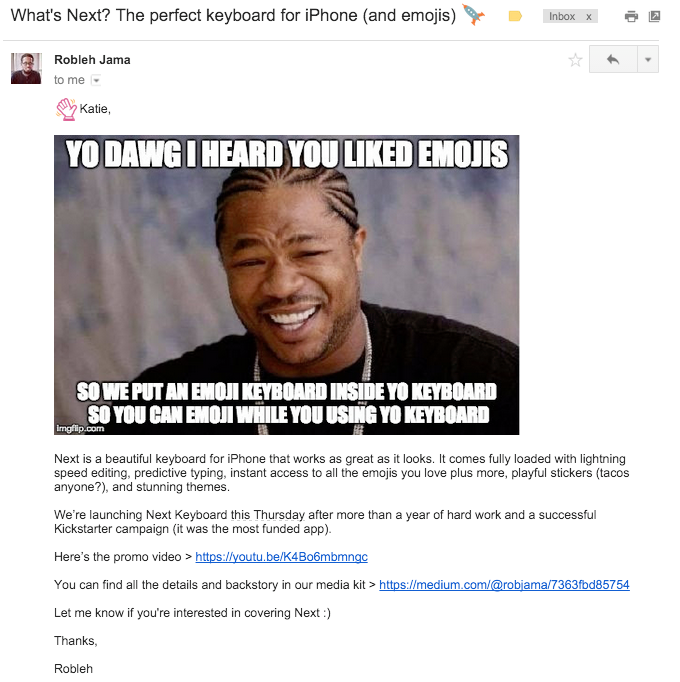 If you’re not getting any momentum after 20 cold emails to reporters, you should re-examine your message and story. Maybe it needs to be more compelling. Return to your processes, and see what makes you different from everyone else. If you’re boring, look into how you can spice things up a bit with your messaging. If you have an unusual stance on something you truly believe in, be more vocal about it. Robleh Jama is the founder of Tiny Hearts, an award-winning product studio. They make their own products like Next Keyboard, Wake Alarm and Quick Fit — as well as products for select clients like Plantronics and Philips. Check out our blog and join our newsletter to learn things like ‘How to get discovered on the App Store’ and ‘How to Make Products that People Love’. Product @Shopify. Previously founder @tinyheartsapps — an award-winning mobile product studio acquired in 2016 by Shopify.